Marilyn R. (Healey) Hess passed away on Friday, February 1, 2019 at home with her loving family by her side. She was the beloved wife of the late Dean B. Hess for 62 years. Born in Attleboro, MA she was the daughter of the late William and Alta (Williams) Healey. Mrs. Hess lived in Attleboro, graduating from Attleboro High School. 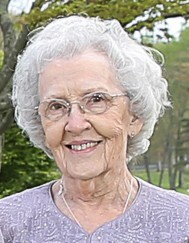 She and her husband made their home in Raynham, MA with their children for 44 years. After retirement, they moved back to the Taunton area. Mrs. Hess was a medical assistant in the office of Dr. Lee Kaufmann for 28 years. She was a devoted wife, mother, grandmother and great grandmother – roles which brought her much pleasure. She was a longtime member of Pilgrim Congregational Church for over 60 years. Marilyn enjoyed cooking, reading and (most of all) being with her family. She is survived by her loving children Robert Hess and Deanne Botelho; son- in-law Tony Botelho; beloved grandchildren Jason Botelho and wife Amanda Silva, Jenna Botelho, Jaime Chaves and her husband Jesse; and great grandchild Ava Marie Botelho. She also leaves her loving cousins Virginia Rubrigi, Shirley Danielian, Loris Williams and many dear friends. Marilyn’s funeral with visitation will be held on Wednesday February 6, 2019 at 9 am followed by a funeral service at 10:30 in the Chapel of the Silva Funeral Home 80 Broadway (at Saint Mary’s Square) in Taunton. In lieu of flowers, donations in Marilyn’s memory can be made to St. Jude’s Children’s Research Hospital, 501 St. Jude Place, Memphis TN 38105.